The Cruising Club of Notre Dame Bay (CCNDB), in association with Good Old Boat magazine, held a regatta on the weekend of August 14-16, 2015. The original plan was to sail from the Lewisporte marina to a waterside restaurant in Hillgrade over Friday and Saturday. That route was modified after I suggested some alternatives during the final planning meeting. My suggestion was to spread the trip over Friday evening, Saturday and Sunday to make it more manageable for the smaller and slower boats, and also for people who had to work on Friday. The itinerary became Lewisporte to Western Harbour, South Samson Island on Friday, where all boats should be able to make it in before dark. As early as possible on Saturday morning, the flotilla would continue on to Hillgrade, with an ETA of between 1300 and 1400. There everyone would gather for a meal at the restaurant. After that there were several options, but the general plan was to start heading back, with an overnight in Moreton's Harbour. On Sunday the fleet could meet up in Western Harbour, Sivier Island, before completing the final leg to Lewisporte. Serenity, Berdel, Timeless, Windrifter, PersuadeHer, Second Chance, & Dreamweaver. As is usually the case with these things, it was difficult to get confirmation on who would be attending, and exactly what the finer details of the event would be. On Friday evening the boats in attendance on the LYC moorings were: Serenity (Paceship PY23), Berdel (Glen-L 30), Timeless (Moody 376), Windrifter (Mirage 27), PersuadeHer (Hunter 31), Second Chance (Bayliner 3788), Dreamweaver (Classic 40), Summertime (Bayfield 25), and Showa (Camper Nicholson 31). Each mooring group did their own socializing, but there was some dinghy shuttling between them. Windrifter, Timeless, Berdel & Serenity. On Saturday morning, a check of the weather forecasts had everyone reevaluating. There were to be stronger winds than had been previously indicated, with the possibility of showers, which would make the voyage somewhat uncomfortable, especially for the less hardy boaters. There was no hard rule that the flotilla must stay together, so while most decided to stay put, Summertime, Showa, and Timeless decided to carry on, and would meet up with Longwinded (Bayfield 36) underway. They had spent the night at Exploits Islands. Timeless was the largest boat in our mooring group, and had been one of the first to arrive at South Samson. This meant that they were the vessel we were all rafted off of. Before they could be let go, all the rest of us had to hook up to the mooring, and ready lines to reattach to each other. I used my dinghy to feed the lines through the mooring eye, and and generally supervise the procedure. This meant, however, that I didn't get any pictures of Timeless leaving. Not long after hitting open water, Jim, aboard Summertime, reported back over the radio, that even well reefed down he was able to maintain hull speed. Their passage would be fast, but rough. Blaine working on making Timeless ready. This left six boats on the moorings. 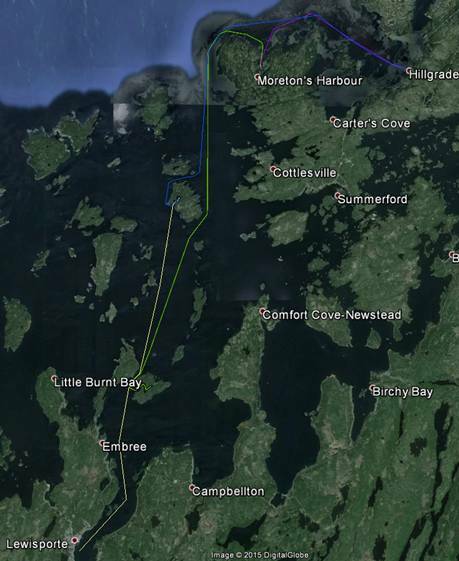 We had considered making the approximately hour long sail over to Exploits Islands, but eventually decided against it. Even though it was very protected from the winds in the harbour, it was still choppy most of the day. During the calmer periods people would row or motor around a bit in their dinghies. I had to go ashore several times a day with the dog, so I was getting lots of exercise. From 9 boats to 6. Windrifter owners Mike and Arlene. Berdel owners Bert and Delcie. One of the bad things about Western Harbour, South Samson is the lack of cell phone signal. It is weak and intermittent. Roxanne's phone was the most consistent, so she was our contact with the outside world. Via texting, we learned that Joanne and Steve Gill were going to sail out to join us aboard Shelby Lynn (Challenger 24). It was an unpleasant trip for them, but they arrived safely around lunchtime. Again, we had 4 boats on our mooring. During one of my trips ashore with the dog, I gathered up some firewood so that we could have a beach bonfire in the evening. Members of our mooring group paddled over just before dark to get things going, and some people from the other mooring came shortly after sundown. Unfortunately, high tide happened at the same time, and made our seating area rather damp. After the fire, with wet feet, we rowed back to our boats, while enjoying the bioluminescence in the water from our paddles. A fire on the "beach". Shelby Lynn, Windrifter, Berdel, & Serenity. The forecast for Sunday called for reasonable weather in the morning, but with winds increasing throughout the day, and the possibility of rain showers. With that in mind, 3 of the boats on our mooring decided to have an early breakfast and get moving. The others would follow later, as they were ready. Berdel motoring back to Lewisporte. Even though the weekend did not go exactly as planned, the event itself was a success. The first Good Old Boat Regatta in Notre Dame Bay brought together various types and sizes of boats to explore and enjoy our waters. We are looking forward to doing it again next summer.